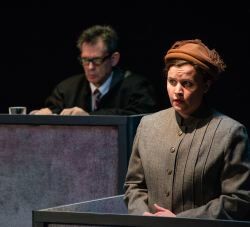 Throughout American Century Theater’s production of Abby Mann’s Judgment at Nuremberg, ensemble members portraying Nazis and their victims act as silent witnesses — ghosts, if you like — whose presence provides context for the legal proceeding at its heart. But these are not the only ghosts haunting any production of this powerful script: the memory of the Stanley Kramer’s 1961 film, with a brilliant cast including Spencer Tracy, Burt Lancaster, Maximilian Schell (who won an Oscar for his performance), Richard Widmark, Montgomery Clift, Judy Garland, Marlene Dietrich, and even the then young and pretty William Shatner is hard to keep out of one’s mind when viewing the stage version of Mann’s story. 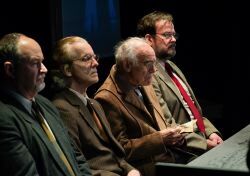 At the center of the play is retired American judge Dan Haywood (Craig Miller), brought to Germany to preside over the 1947-48 trial of German judges who had collaborated, or actively participated, in Nazi-era injustices. The headline-grabbing war crimes trials, convicting Goering and other leading Nazi figures, were already complete, and the looming threat of a Cold War confrontation with the Soviet Union was leading many to believe gaining support from a revived German nation was more important that pursuing justice against smaller fish. Haywood is the very figure of what we would want an American judge to be: low-key; kind; seeking the intellectual, historical, and cultural background of the case; understanding of the complexity of human motives; and focused entirely on justice, notwithstanding considerations of realpolitik. Miller is utterly believable in the role, never showy, always inhabiting the character. Some of his best moments are those in which he expresses uncertainty — “I don’t know what to think,” he says more than once. Even when delivering the sternest of judgments, he does do in a compassionate tone. Without attempting to channel Spencer Tracy, Miller makes Haywood a memorable and admirable figure. 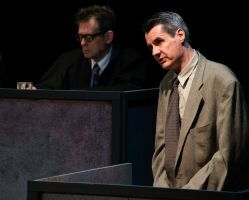 In what is the play’s showiest role, defense attorney Oscar Rolfe, Steve Lebens does, to an extent, channel Maximilian Schell’s take on the role. A brilliant advocate, adept at devastating cross-examination, he acknowledges the horrors of the Nazi regime while, as a German patriot, he insists that it is not right to brand the entire German nation as criminal, something he sees as the inevitable implication of the trial. As he questions witnesses who were treated brutally in the defendants’ courtrooms, trying to show that there may have been a legally sound basis for executions and sterilizations, he knowingly reopens their emotional wounds. Lebens is at is best when facing the moral compromises of his own position, attacking people he knows to have been victims on behalf of persons who he knows acted unjustly, not only in the cause of his lawyer’s obligation to zealously defend his clients but in the cause of defending the honor and future of his nation. The tragic principal defendant, Ernst Janning (Michael Replogle), was a leading jurist and legal scholar before and after the Nazis took power. He gave credibility to the Nazi legal system, and he personally and knowingly made unjust decisions on behalf of that system. As Haywood comments toward the end of the play, Janning loathed the evil he did, yet still chose to do it. In the film, Burt Lancaster gave Janning a commanding presence, dominating even those scenes in which he had no lines, proud even in taking responsibility for his crimes. Replogle takes the role in a quite different direction, displaying less gravitas while giving Janning a somewhat diffident, almost academic air, with an overlay of humility, more willing to admit, in his voice and body, that his choices in life have defeated him. The approach Replogle takes to Janning is echoed, in one important respect, by Karen Rosnizeck’s Mrs. Bertholt. Both members of the pre-Nazi elite, they hated Hitler and his followers not so much for their evil as for their middle-class grossness. Mrs. Bertholt recounts a story in which Janning told Hitler to his face that he was too “bourgeois,” and Janning himself recoils at sharing prison quarters with his fellow prisoners, who in addition to their corruption were not the sort of people with whom he would ever have shared time and space. Mrs. Bertholt is the widow of a Wehrmacht general hanged for his part in the Malmedy massacre (the murder of 84 American POWs during the Battle of the Bulge). Aristocrats both, they despised the Nazis but supported the war as patriotic Germans defending their country. This class division among the Germans, and Hitler’s success in co-opting the old elites despite their disdain for him, are sometime-forgotten aspects of the period’s history that Mann illuminates in the script. Rosnizeck’s Mrs. Bertholt is a gracious, civilized figure whose expropriated house provides quarters for Judge Haywood. Rosnizek’s portrayal emphasizes Mrs. Bertholt’s bitterness over her husband’s execution and over the entire war crimes trial enterprise — she stalks out of the final court session after the guilty verdict is announced — but could have benefitted from an additional touch of world-weariness. Rosnizeck also served as the production’s accent coach, and she and the actors playing German characters deserve credit for very credible German accents. Colonel Ted Lawson (Bruce Alan Rauscher), his memory seared by the sight of the Dachau concentration camp, is appropriately aggressive as the prosecutor, seeking to punish as harshly as possible anyone associated with the Nazi regime. Frequently over-matched by Rolfe as a trial tactician (apparently to the point of neglecting to cross-examine one defense witness), Lawson sometimes gives way to his frustration, yet has the overwhelming moral force of responding to Nazi atrocities on his side (he shows films of the death camps at one point in the trial). A stronger sense of the overwhelming anger eating away at Lawson’s soul would have been a welcome added dimension to Rauscher’s portrayal. Mann’s script is filled with short character roles, all of which were played successfully. 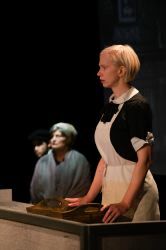 Christopher Henley, as Rudolph Peterson, a now-timorous and nervous victim of sterilization, and Mary Beth Luckenbaugh, as Maria Wallner, a victim of a show trial that resulted in the execution of an elderly Jewish friend, stood out. Luckenbaugh chose to make the character angrier, and less destroyed, than the equivalent character in the movie, played by Judy Garland. The choice worked. This was one of American Century’s more ambitious shows technically. Sean Allan Doyle’s complex sound design included such items as excerpts from Hitler’s speeches, Nazi marches, snippets of Wagner, bird sounds in the prison courtyard, and a clang when a prison sequence began. They all fit the occasion and were cued impeccably. The production made extensive use of projections (credited to Patrick Lord and Shayne Weyker), for settings (e.g., the courtroom, the prison, scenes of the city, though not any of Nuremberg in its late-40s bombed-out state) and for the films of the carnage of the concentration camps. These were shown at one end of the oblong playing area, with a distracting but probably unavoidable cutout around the defendants’ dock. 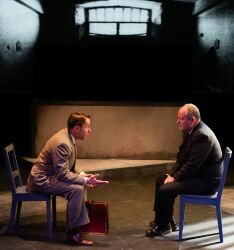 In the playing area, with audience seating on either side, Patrick Lord’s set design featured the defendant’s area at one end, the judges’ elevated bench at the other, set dressing pieces in between. The set worked effectively for the courtroom scenes but was less evocative for some other settings, such as the Judge Haywood’s residence, a bar, or the venue of a concert that Judge Haywood attended with Mrs. Bertholt. Rip Classen’s costumes were appropriate to the period and the characters. Particular blessings upon him for getting the right color for U.S. Army uniform jackets of the era, something I have seen done wrong in more productions than I care to think about. The most notable, and very effective, feature of Marc Allan Wright’s lighting design were the four large fluorescent ceiling fixtures, which provided harsh illumination in the courtroom scenes, especially when they came on quickly following a scene with lower lighting. 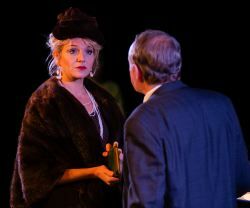 Along with the Shakespeare Theatre in Washington, American Century consistently produces the best and most interesting dramaturgical material in the area. The Audience Guide for Judgment at Nuremberg is one of the most valuable the group has produced, containing fascinating history of the events portrayed in the play as well as thought-provoking discussions of the legal and ethical issues raised by the war crimes trials. Even if you don’t pick up a copy — and I recommend doing so — this is a play to see not only as well-produced and acted theater, but as a springboard for thought and discussion about matters that have a great deal of contemporary resonance. 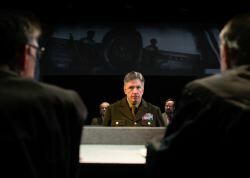 Much as the play deals with a particular slice of modern history, it sadly remains relevant today, as war-crimes, genocides, imperialist invasions, and politically-motivated kangaroo courts fill the daily news-stream. Mann told his story first as a life television play, then as a star-studded Hollywood motion picture, and finally as a Broadway play — keeping much of the material intact from medium to medium. We’re presenting the Broadway script, adding selected material from the film, and introducing a framing device that brings “ghosts” from Hitler-era Nuremberg into a silent dialogue with Mann’s eloquent writing. On January 1, 2001, then President Clinton signed the Rome Treaty for an International Criminal Court. He said, “In taking this action, we reaffirm or support for international accountability and for bringing to justice perpetrators of genocide, war crimes, crimes against humanity based on our involvement in the Nuremberg tribunals that brought Nazi war criminals to justice.” Senator Jesse Helms of North Carolina called Mr. Clinton’s decision “as outrageous as it is inexplicable. I have a message for the outgoing President. This decision will not stand.” Many others echoed Helms’ objections, including President Bush. Their reason was it could inhibit the ability of the United States to use its military to meet alliance obligations and participate in multinational operations. The first of the Nuremberg trials were concluded on October 1, 1946. Herman Goering, Reichsmarshall. Charged with conspiracy, crimes against peace, war crimes, crimes against humanity. The verdict: guilty on all accounts. The sentence: death by hanging. Rudolph Hess, Deputy Fuhrer. Verdict: guilty on two counts. Sentence: life imprisonment. Joachim von Ribbentrop, Reich Minister for Foreign Affairs. Verdict: guilty on all counts. Sentence: death by hanging. Nuremberg, Germany. October 1, 1946. The conclusion of the trial of 22 top Nazis accused of war crimes. Twelve were sentenced to death. Three were acquitted. Seven received prison sentences ranging from ten years to life. October 16, 1946. The sentences of death were carried out. Julius Streicher. Von Ribbentrop. Wilhelm Keitel. Ernst Kaltenbrunner. All except Herman Goering who cheated the hangman by taking his own life. The first of the Nuremberg trials were over. Still to come were twelve more trials of 177 diplomats, generals, SS officers, high Nazi officials, doctors, judges, directors of IG Farben, leading German business and professional men, whose cooperation was essential to the success of the Nazi conspiracy. We hope you find the play as compelling as the actors and I did while working on it. Michael Replogle as Ernst Janning, Kim Curtis as Emil Hahn, Victor Gold as Werner Lammpe, Tom Fuller as Frederick Hoffstetter. Mary Beth Luckenbaugh as Maria Wallner. Background: Tel Monks as Judge Ives. Bruce A. Rauscher as Colonel Lawson. Background: Kim Curtis as Emil Hahn, Tom Fuller as Frederick Hoffstetter. Karin Rosnizeck as Frau Bertholt, Craig Miller as Judge Haywood. 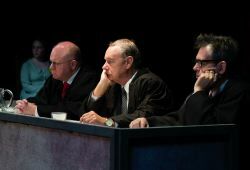 Paul Klingenberg as Judge Norris, Craig Miller as Judge Haywood, Tel Monks as Judge Ives. 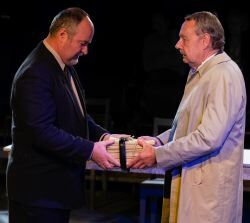 Michael Replogle as Ernst Janning, Craig Miller as Judge Haywood. Steve Lebens as Oscar Rolfe, Michael Replogle as Ernst Janning. This article can be linked to as: http://showbizradio.com/go/10130.